Rosacea is a chronic inflammatory skin condition which affects over 14 million people in the US. Its cause is still a mystery and according to the medical profession it cannot be cured only managed. 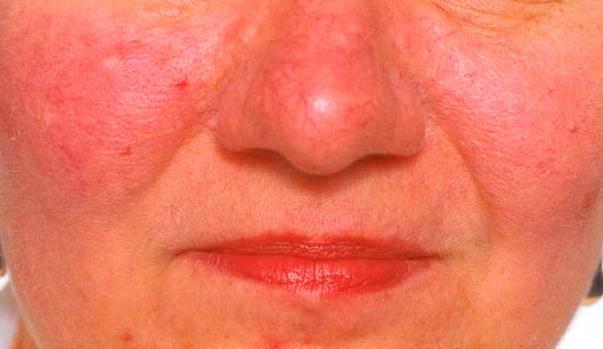 Rosacea may manifest as general redness and flushing on the nose, cheeks, forehead and chin; it may flare when triggered to produce bumps and acne-like inflammations; left unattended it may result in prominent spider like blood vessels, thickening of the skin and bump like lesions (WC Fields trademark nose) and can even affect the eyes and eyelids with redness and reoccurring sties . Azelaic Acid - an anti-inflammatory, anti-bacterial compound which can reduce redness and inflammation and curtail bacteria growth associated with Rosacea. Unfortunately it can also be a skin irritant and has induced cases of hypo pigmentation (loss of skin pigmentation or white patches) as well as facial hair growth. Metronidazole - an antibiotic, amebicide, and antiprotozoal compound the mechanics of which are complex and understudied. Basically it is absorbed by anaerobic bacteria (bacteria which do not require oxygen to survive) and starts a chain reaction of chemical processes ending with the production of toxins which kills the bacteria. Adverse reactions for topical use include local redness, dryness, and/or skin irritation; and eye watering (if applied near eyes). Prolonged systemic use of metronidazole has resulted in nausea, diarrhea, and/or metallic taste in the mouth. Recently, there have been reported cases of interaction with SRI/SNRI antidepressant drugs inducing a potentially life-threatening condition called serotonin syndrome. First and foremost it is important with Rosacea to seek a dermatologist’s assistance in diagnosing the problem and considering treatment alternatives. When weighing the costs and possible side effects of current treatment options you should consider pure emu oil and emu oil based natural topical applications as an alternative or complementary option. Emu Oil brings deep delivery of moisture and bio-nutrients to increase skin's overall health and rejuvenation properties. It can be used as a complementary option to counter the drying or irritating effects of other treatments. Emu Oil visibly reduces redness and inflammation while allowing the skin to breath. By increasing blood flow and cell permeability Emu Oil allows toxins to leave the cells and oxygen to enter. This process flushes out and drains inflammation from the tissue. Emu Oil is bio-static meaning it will not foster the growth of bacteria. Emu Oil works as a highly effective transdermal carrier. When used as a base oil as in Redness and Blemish Control it encapsulates other anti-inflammatory and anti-bacterial ingredients such as arnica and tea tree oil and escorts them through the skin to the affected tissue.